Your dentist may be a leader in dental technology if the dental equipment in their office includes an Itero intraoral digital scanner. These revolutionary scanners can accurately create detailed three-dimensional images for the diagnosis and treatment of many dental health issues. Just like magic, by simply moving the scanner’s wand around in your mouth from a variety of angles, your dentist can capture the individual images that are used to create a 3-d image of your mouth. The image is displayed on its screen, saved, and then can be instantly shared with the dental laboratory if necessary, allowing treatment to begin much more quickly. These scanners can greatly assist with the early detection of dental conditions that are not painful or may not be seen by the unassisted eye including issues such as cracked teeth, decay, or gum disease. Instead of simply hearing about the problem, you can actually see it on the screen. For treatment purposes, they can produce the detailed three-dimensional images needed to create the very best dental models for implants, veneers, and crowns. 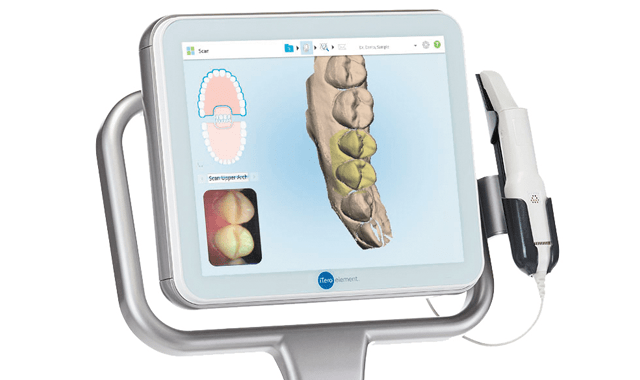 Additionally, an Itero scanner can also assist with the diagnosis and treatment planning of orthodontic issues. In fact, these scanners are compatible with the Invisalign system for tooth straightening, allowing your dentist to easily show you how your treatment will look. Throughout the tooth straightening Invisalign treatment, these scanners can quickly and efficiently track both fit and progress. Another added benefit is that these images can be submitted to your dental insurance company in order to substantiate and strengthen any claim and increase the claim processing time. If you would like to learn why our patients love our leading-edge technology, Dr. Heidi Finkelstein and her caring staff at My Plantation Dentist can help. To schedule your appointment, please contact us today at 954-584-1030.